For all Conor Sheary has experienced during four NHL seasons, from winning back-to-back Stanley Cups in Pittsburgh to playing alongside Sidney Crosby, even the 26-year-old Buffalo Sabres winger has trouble ignoring the score sheet following games. There have been many nights this season where he hasn't liked the outcome. Sheary scored only four goals over a 43-game span during the Sabres' winter slide, and the angst of failing to produce crept into the rest of his game. Finally, under the self-induced pressure of needing to score, Sheary had two goals against his former team March 1, and has four goals and three assists over his last 11 games,while being a menace defensively. When the Sabres begin a three-game road trip Saturday night in Montreal, Sheary will skate on a new-look top line with Jack Eichel and Alex Nylander. "Personally, I feel like I’m playing a little bit better," Sheary said following practice Friday. "I’m starting to use my speed a little bit more, and I’m creating a lot more turnovers than I was maybe earlier in the season. That’s the way I’m going to be effective. I may not show up on the score sheet every night, but if I can help my team win in other ways, that’s going to be a good thing." Sheary scored 41 regular-season goals over his final two seasons in Pittsburgh before he was dealt to the Sabres last June. He ranks sixth on the team with 32 points in 69 games, surpassing his total of 30 in 79 games last season with the Penguins. However, Sheary has fallen short of his own expectations. Six of his 13 goals were scored during the Sabres' first 16 games, as he was initially given the opportunity to play on Eichel's left wing. Jeff Skinner was elevated to the first line and scored 10 goals during the Sabres' 10-game winning streak, while Sheary failed to produce in a lesser role. As Sheary's struggles worsened, he wasn't using his speed to strip pucks from unsuspecting opposing forwards and was not forechecking with the type of tenacity that helped him during that fast start. Though Sheary has 19 points in 47 career playoff games, including two Cup runs, his confidence wavered. Even the sport's elite players can't fend off the frustration of failing to score. "I don’t know the reason," he recalled. "Maybe I was a little bit stressed out about not scoring. Once I got through the fact that I don’t need to do that every game, I think it freshened my mindset and I’m approaching each game with a little bit better mindset than I was before." Sheary is not unfamiliar with such slumps. He had only four goals during a 44-game span last season with the Penguins and did not break out until he was reunited with Crosby and Jake Guentzel. Sheary didn't need a similar assignment to spark change. 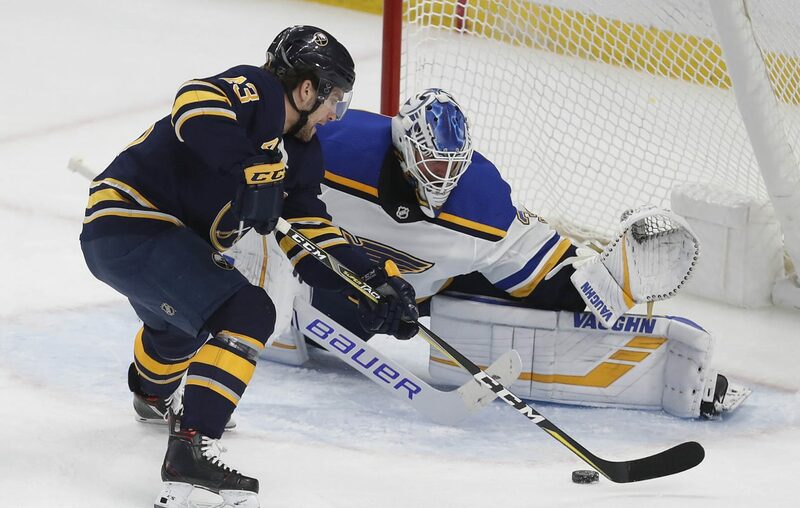 Since Feb. 26, he leads all Sabres forwards with a 52.40 percent on-ice 5-on-5 shot-attempt differential and has shown why General Manager Jason Botterill thought he could be a solution to the team's need for secondary scoring. "It’s always good to score and you get more confidence," coach Phil Housley said of Sheary. "You can see it in his strides. He’s using his speed to get in on the forecheck. He’s turning over pucks and it’s good to see him finally contribute offensively." Housley broke up his top line during a 4-2 loss against Toronto on Wednesday night and has separated Eichel, Skinner and Sam Reinhart. The hope is Sheary's recent play and chemistry with Eichel can help spark the offense. Eichel has no goals in his last five games, while Skinner has one in his last 16 and Reinhart is goalless in his last 11. Sheary and Eichel have played only 115 minutes, 19 seconds together at 5-on-5 but had a shot-attempt differential of more than 50 percent and generated more scoring chances than their opponents. "I’m going to approach it the same," Sheary said of playing with Eichel. "A few instinct things will be a little bit different, especially in the offensive zone and off the rush. He obviously has the ability to find you in places that sometimes you wouldn’t even expect the puck. Try to get open and find that soft area for him." With the Sabres 14 points out of a playoff spot entering Friday's games, they hope to simply build momentum over their final nine games. Nylander and Casey Mittelstadt are being given prominent roles. As important, Botterill is evaluating who can be part of the solution for next season. Sheary will be an unrestricted free agent next summer and will count $3 million against the cap in 2019-20. His playoff experience and leadership can be valuable for a team that is in need of both. This is the first time in his short NHL career that he is not playing meaningful games in late March, but Sheary does not think those struggles will last for long. He believes the best is yet to come in Buffalo. "I think we know we have a good core group of guys in there," he said. "As far as the end of the season, we want to make sure we’re striding in the right direction and building towards the future. I think we’re a team that’s going to be around for a little while and not just make a splash, so this is a big learning process for us and hopefully we can build off that." While defenseman Zach Bogosian returned to practice Friday, the Sabres will be without Matt Hunwick in Montreal. Hunwick, 33, is day-to-day with an upper-body injury, Housley said. Hunwick has been a healthy scratch the past two games and has two assists with a minus-7 rating in 48 games this season.